That brief text and the accompanying graph are the entirety of this (sad) blog post. Lets ignore the the awkward choice of words, the decision to spell out some numbers but not others, and the inconsistent verb tense for a moment. 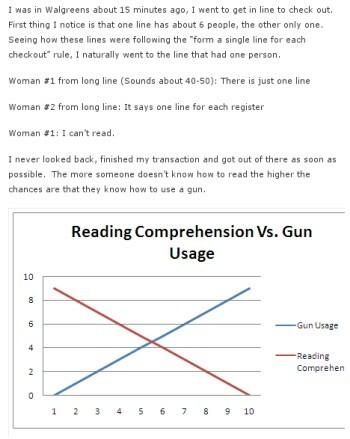 What’s really sad is the way that blog post makes the utterly ridiculous and unsubstantiated claim that “The more someone doesn’t know how to read the higher the chances are that they know how to use a gun.” This author knows how to use a gun, and is highly educated. This gun owner and many others are educated and intelligent people too. Doctors, lawyers, Nobel prize winners, and cancer researchers own guns. Indeed, half the country’s households own guns, and that includes people from every walk of life. And as a final note, perhaps the author of that blog post should first ensure his or her writing is devoid of the errors I mentioned above, before making unfounded and ridiculous statements about the literary abilities of gun owners ?